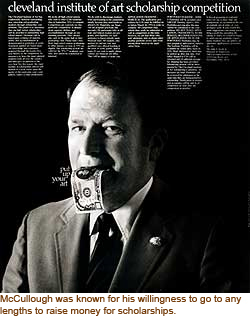 On August 31, 1988, Joseph McCullough completed a 33-year term as president of the Cleveland Institute of Art. 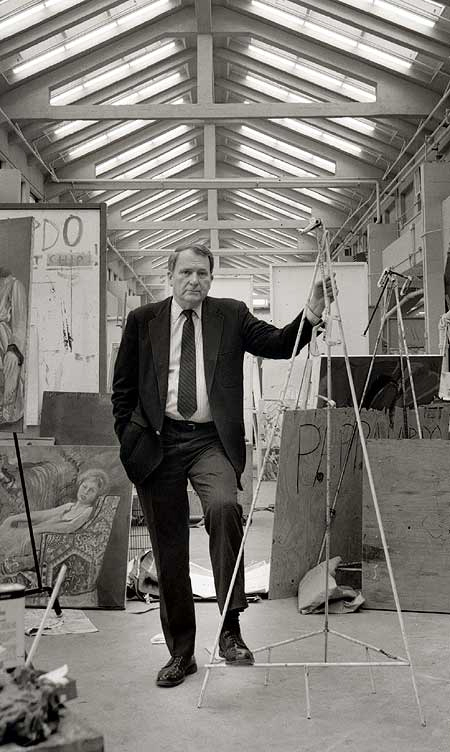 During his remarkable tenure, he led the institution's transition from art school to accredited independent college of art and design, expanding enrollment, facilities and curriculum; he was a national leader in arts education as well as a sought-after jurist; and he maintained a distinguished painting career for which he was awarded the Cleveland Arts Prize for Visual Arts in 1970. A Pittsburgh native, McCullough came to Cleveland in 1940 to study at the Cleveland School of Art (forerunner of the Cleveland Institute of Art). He left school in 1941 to serve as a bomber pilot in the Eighth Air Force, flying 35 B-24 missions over Europe. In 1946, he resumed his studies in Cleveland, then left again to earn a B.F.A. (1950) and M.F.A. (1951) from Yale University. After a brief teaching stint in New Haven, he returned to Cleveland in 1952, to teach at his alma mater and serve as assistant director under Laurence Schmeckebier. In 1954, Schmeckebier shocked everyone at the school's opening convocation by announcing his sudden resignation. McCullough, then 32, found himself performing the director's duties, without the benefit of a title. He would later explain that life had prepared him for the challenges of management: He knew how to dodge enemy flak, and he had already managed to support a family of four on a graduate student's salary. McCullough needed all his life skills when he was named director in 1955. Trustee and benefactor George Gund gave him succinct instructions: "You take care of the inside. I'll take care of the outside. Just make this the best art school you know how, but don't spend any money." During his first two years as director, McCullough oversaw the construction of a new building on East Boulevard in University Circle, which provided two of the three elements he deemed necessary to produce good art: light and space. He addressed the third element, time, by pushing for a fifth year of undergraduate study leading to a B.F.A. During the 1950s and '60s, he also developed a solid liberal arts program, building a first-rate faculty in every discipline. His vision paid off in 1970, when the Cleveland Institute of Art (CIA) won accreditation from the North Central Association of Schools and Colleges. It was the nation's first five-year B.F.A. degree program. When George Gund died in 1966, McCullough was forced to add the "outside" to his list of responsibilities. Fund raising would become a significant challenge, especially since the school had already outgrown its East Boulevard space. McCullough looked just down the road, to Euclid Avenue, for his next expansion. He chose the abandoned Ford Motor Company assembly plant, a 160,000 square-foot, sky-lit factory that once produced Model Ts. McCullough purchased the factory in 1981 and led a $7.5 million capital campaign the following year to convert it to studio space. When the work was complete (1984), the institute was able to offer an astounding 546 square feet of space for every student. This generous allotment remains the envy of every art school in the country. Small wonder the annex, affectionately known as the Factory, was renamed the Joseph McCullough Center for the Visual Arts. McCullough's influence went well beyond the institute, however. For more than two decades, he chaired the Fine Arts Advisory Committee for the City of Cleveland's Planning Commission. As leader of this architecture review board, he gave aesthetic input on every new development and renewal project, including significant buildings on the campuses of Cuyahoga Community College and Cleveland State University, the SOHIO (now BP) building, the Lausche state office building and the expansion of Cleveland-Hopkins airport. 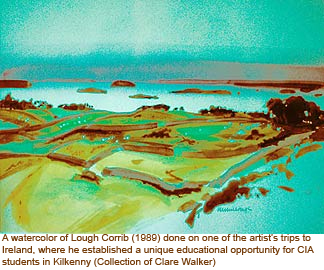 On the national scene, he led the National Association of Schools of Art & Design. He served on dozens of juries for prestigious art exhibitions and competitions, always replying "If I can be of help" to requests for his involvement. He was also an international presence in art education, scouring the globe to study innovative programs and teaching techniques. He promoted regular exchanges with schools and design studios in Kilkenny, Ireland, Osaka, Japan, Florence, Italy and Lacoste, France. Throughout his career, he continued painting, recording his many travels with his wife, Elizabeth. Inspired by his passion for birding and fly-fishing, he communicated his sense of wonder at nature's bounty. In retirement, he has refitted his home/studio to reflect a more serene lifestyle. Today, his worktable holds spools of colored thread and boxes of feathers, wire, and hooks. His preferred medium is fly-tying, and he proudly displays all manner of lifelike crickets, ants, worms, even gnats. Each is crafted meticulously and lovingly. The administrator has retired. But the artist is still at work.